Donatelli’s last three championships with the Baltimore Blast are particularly special. 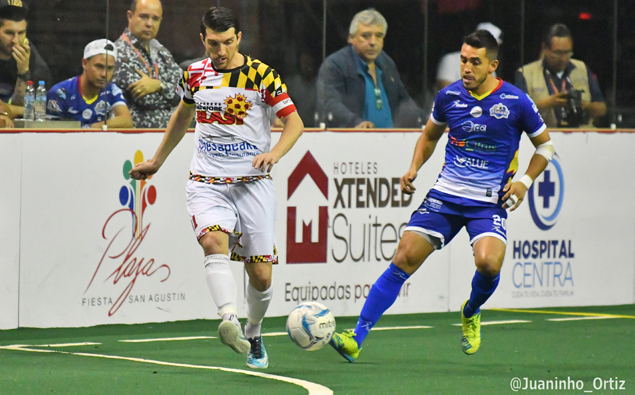 He and the club made sports and indoor soccer history recently by defeating the Monterrey Flash 4-3 on March 25 to capture the club's third straight league title. This past season, Donatelli was a significant contributor to the Blast’s success. He tallied 22 goals and contributed 21 assists in 20 games and finished as Baltimore's leading scorer. His 43 total points ranked 10th in the entire league and earned him Second Team All-MASL honors. Donatelli attributes his personal growth as an indoor soccer athlete to the experience gained by training with the now-defunct Philadelphia Kixx of the Major Indoor Soccer League as a college athlete at Temple University. Considerably younger than many of his teammates, the time spent with the Kixx gave Donatelli a “leg up” on the competition he would eventually play against as a professional indoor soccer player. That first season with the Kixx was a successful one as as he, along with two other Ocean City and Temple University teammates (Pat Hannigan, Steve Wacker) helped Philadelphia win a Major Indoor Soccer League (MISL) title. It was Donatelli's first pro championship. In all, Donatelli has played 12 seasons of professional soccer in his career. He played 10 seasons of outdoor soccer where he won three United Soccer League titles with the Vancouver Whitecaps (2006), Montreal Impact (2009) and the Charleston Battery (2012). Right after winning the 2012 USL Pro championship with the Charleston Battery, Donatelli signed with the Blast, a club that was in the early stages of an historic streak. Baltimore had reached the league finals in back-to-back season but fallen short before Donatelli helped Blast win the 2012/13 MISL title in his first season (he scored a goal in the championship game). After lifting his second career indoor trophy, Donatelli and the Blast would reach the league finals in the next five years running. Baltimore fell short in the 2013/14 and 2014/15 league finals, but would win the next three championships. Starting with the 2010/11 season, there has never been a run of dominance in the history of American indoor soccer like the Blast. No Division One indoor team has ever reached eight consecutive league finals. And Donatelli wasn't just along for the ride. He played a major role in the three-peat. He scored two goals, including the championship winner in overtime in the deciding game in 2015/16 Ron Newman Cup championship, followed by another pair of goals in Game 2 of the Finals the next year. This year, he assisted on the opening goal for the Blast in their 4-3 win over the Monterrey Flash. What makes the three-peat even more impressive is that all three trophies were lifted in their opponents' arena, with all three of them located in Mexico. A couple of years ago, Donatelli decided to shift his focus solely to indoor soccer. He believed his game was a better fit for indoor game, especially at this stage of his career. Without the physical strain of playing an outdoor season during the summer, and playing an indoor season from the fall until the spring, Donatelli could finally let his body recover during an offseason and allow him to prosper into one of the top players in the league. Donatelli is grateful for his personal triumphs but recognizes that soccer is a team sport. He has been privileged to be surrounded by exceptional players, many of whom made up the nucleus during the Blast's three-peat. Finally, he believes the Blast’s coaching staff implemented a successful training system providing growth to the team year after year. Donatelli also said that he owes a part of his success to his time in Ocean City. During his two seasons with the Nor'easters (then known as the Barons) he helped the club make back-to-back PDL playoff appearances, earn a Northeast Division title (2004) and complete a rare undefeated regular season in 2004. He was an All-Conference selection in 2005 while also leading the club to three wins in the Lamar Hunt US Open Cup. He still ranks fifth on the club's all-time scoring list (14 goals, 9 assists). He said the club played a large part in his development and preparation for the professional level because he gained exposure to playing in the US Open Cup professional teams while still a young player. At the soon-to-be age of 34, Donatelli plans to take some much-needed time off during the offseason and prepare for next season with the Blast, with the goal of earning an even more rare "four-peat", something only two teams in the history of modern indoor soccer have ever done.